The Ironman Achiever elliptical trainer features center-drive technology with biomechanically correct body positioning for a superior workout. The large LCD monitor shows your time, distance, speed, RPMs, resistance level, pulse rate, and calories burned. It has 18 built-in programs, including 12 pre-sets, 4 heart rate control, 1 pulse recovery, and 1 custom program. Other console features include a body mass index (BMI) calculator and data storage for up to 9 users. The Ironman Achiever elliptical trainer has a number of cool features including a heavy frame of 227 pounds, sealed commercial bearings at pivot points, and a smooth friction-free magnetic resistance system. 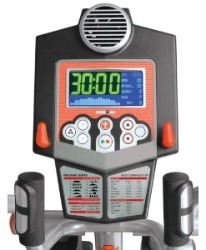 Other features include forward and reverse pedaling direction, an ergonomic 21" stride length, molded comfort grip handles with finger grooves, oversized 18.5" foot pedals, and a wireless chest strap transmitter (included) to automatically adjust the machine’s resistance to your workout setting. Despite having to give up an incline feature because of the center-drive design, there aren’t any problems with the machine or its performance. It is as solid as they come. Reviews by Achiever owners indicate they are pleased with their machine. The Ironman Achiever elliptical trainer has been around for several years and can still be found for sale online both new and used. You should know that this is a 2008 model that Ironman came out with just before it went bankrupt and the parent company, Keys Fitness, went out of business. You can still get replacement parts for the Ironman Achiever at Treadmill Doctor, but, Star Trac Fitness, the new owner of Ironman, is not covering warranties on Ironman products made in 2008 and earlier. So consider yourself warned about a murky manufacturer’s warranty on this one. 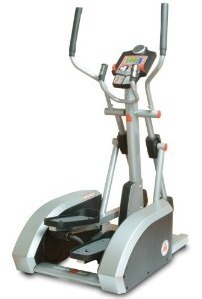 If you are interested in a center-drive elliptical trainer, your best bet is to check out the popular LifeCore CD400.